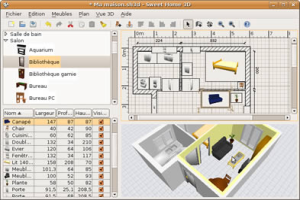 This location methods can be enabled or disabled by the user on the preferences or with some widgets. As the data couldn’t be obtained until the location is determined, the app didn’t showed data, receiving this kind of error reports from some users. 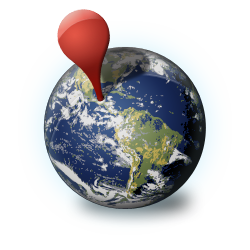 The best solution that I found is to mantain two separated providers, with different precisions and receive location updates using both. This is a trick that we are using on our Gas Stations Spain app and also on Wikiplaces (open sourced). As many of you know, this year I’m involved on Android with my project Mobialia. 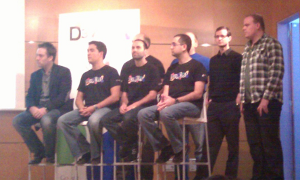 On February I was on the Android Developer Lab at Madrid and today I returned for the Google DevFest. Then the sessions where split on two lines, I assisted to the Android, Chrome&HTML5 and Maps related. Our beloved Reto Meier was speaking at the Android Sessions, much more technical than on February’s Android Developer Lab (good!). On his first session he made a great presentation about good and bad practices developing Android Apps (I suggest every android developer to see it! ), on the second he speaked in detail about Cloud to Device Messaging and vice-versa. He gave me lots of app ideas using this feature. Finally he swowed us proudly his new Samsung Galaxy Tab and encouraged us to adapt our applications to the new tablet devices. There were also very short presentations of spanish app developers (eAdventure, LibreGeoSocial, Inmobilia, Sicad and great the one of AnderWeb!). Next, Paul Kinlan speaked about Chrome Apps and Extensions, the App Store and HTML5 on detail. I’m also very happy to see the progression of HTML5 and how Chrome is leaveraging the innovation towards a better web. Quite funny to see a modified Pacman Doodle controlled with the acceleromers of the iBook. There was also a presentation of Fiabee showing their HTML5 app and Chrome extension. On the last sessions with Josh Livni talking about maps and presenting the Google Maps API v3, I was very impressed with maps customization, Fusion Tables and the new Google Street view API possibiliting the creation of 360º photos and adding them on specific locations (as inside a bar!). All the sessions where recorded on video and will be avaiable at the Google DevFest Madrid web site. Jim Ablett has published a packaged executable for my Carballo chess engine. He also made a pretty logo for it, shown here. 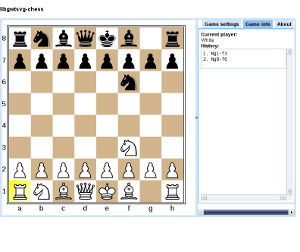 Check his page to download executables for Carballo and a lot of other chess engines: Jim Ablett’s Winboard Chess Page. Thanks Jim for your great work! Static Exchange Evaluator (SEE): the biggest change, affects move ordering introducing more move generation phases, also affects LMR, etc. UCI Options: can configure Hash Size, Book, LRM, IID, extensions, the evaluator to use, etc. Finally the Negascout code did not improve results at tournaments, so all the Negascout code is commented in the SearchEngine. I’ll continue to investigate. With this release I include an package to run the program from chess GUIs like Arena, so now it can be included in “official” tournaments. ELO at tests had a big increase from last version. Now scores over 2330 ELO points at BT2630 test (from the 2100 of Carballo 0.2). Also the positions solved of the “win at chess” test are now 275 of 300 (from the previous 237/300), well, also helped that the EPD parser had a bug and didn’t work well with positions with more than one solution. In LCT II also scores 2300 ELO. All the tests results are in the SVN, at the folder “testresults”. But at tournament (playing against other java chess engines), the improvement is not so much. Now I think is over BrembroCE, but remains behind Jonathan Pettersson’s Mediocre, Alf and Frank Walter chess engines. I will center the next testing in tournament play. It is a work-in progress, but a good framework to test some ideas in chess programming and good enought to play some interesting games against it (well, actually I am not able to win it, but I am a very poor chess player). Now I’m mounting my kitchen from Ikea, so I haven’t time to improve Carballo, but in a near future I’ll continue working on it.